On Thursday, North Korean state media reported on what appears to be leader Kim Jong Un’s first so-called “field guidance” tour in 2019. 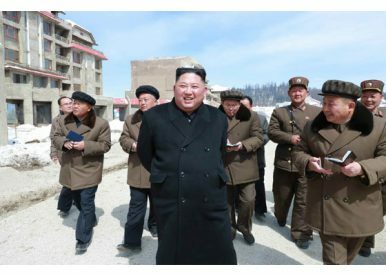 Kim “walked round the township of Samjiyon County under construction to learn about how the construction is now underway,” the official state newspaper Rodong Sinmun reported on Wednesday. The North Korean leader, who almost one year ago announced a “new strategic line” for the country focusing on economic development after the qualitative completion of its nuclear deterrent, praised progress on the construction projects in Samjiyon county. Samjiyon county is in the northern part of North Korea, in Ryanggang province, bordering China. It is the county where visitors to Mount Paektu from the North Korean side access the mountain. “If the construction is vigorously pushed forward at the current speed, the project should be finished by the appointed time as scheduled by the Party,” Kim noted. The report of field guidance at Samjiyon comes as North Korea enters a busy month in April, with the country’s parliament, the Supreme People’s Assembly (SPA), scheduled to convene on April 11. The meeting of the SPA will be the first since new deputies were elected last month. Though still unconfirmed, Kim may choose to use the occasion of the SPA’s convening to deliver a policy address on domestic priorities and possibly on how North Korea might proceed in stalled negotiations with the United States after the second summit between Kim and U.S. President Donald J. Trump in Hanoi, Vietnam, at the end of February. Since the conclusion of the Hanoi summit without any agreement between the two countries, North Korea has been largely silent about its diplomatic approach toward Washington, with the exception of a press conference held in Pyongyang in mid-March. Beginning in February, North Korea also began restoring at least two facilities it had dismantled in 2018, including a staging building for satellite launches and a missile engine test stand, both at the west coast site known as Sohae. As the SPA convenes in Pyongyang, South Korean President Moon Jae-in is slated to visit the United States to discuss the future of diplomacy with North Korea with Trump.